$22.8M project • With the infrastructure largely in place, the fields are expected to hold first events in August 2015. Francisco Kjolseth | The Salt Lake Tribune Rick Graham, public works director for Salt Lake City points out the area mitigated f Francisco Kjolseth | The Salt Lake Tribune Construction is moving along on the new Salt Lake City soccer complex along the Jorda Francisco Kjolseth | The Salt Lake Tribune Construction is moving along on the new Salt Lake City soccer complex along the Jorda Francisco Kjolseth | The Salt Lake Tribune Construction is moving along on the new Salt Lake City soccer complex along the Jorda Francisco Kjolseth | The Salt Lake Tribune Construction is moving along on the new Salt Lake City soccer complex along the Jorda Francisco Kjolseth | The Salt Lake Tribune Rick Graham, public works director for Salt Lake City talks about the construction th Francisco Kjolseth | The Salt Lake Tribune Construction is moving along on the new Salt Lake City soccer complex along the Jorda Francisco Kjolseth | The Salt Lake Tribune Construction is moving along on the new Salt Lake City soccer complex along the Jorda | Courtesy image Site plan for the new Salt Lake Athletic Complex. 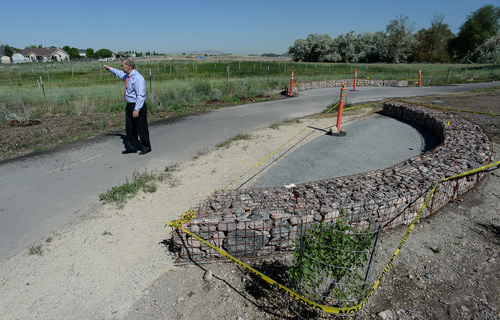 Francisco Kjolseth | The Salt Lake Tribune Rick Graham, public works director for Salt Lake City points out the area mitigated for wetlands alongside what will soon be the Salt Lake City soccer complex near the Jordan River in North Salt Lake where the underlying infrastructure has been laid. By August of 2015 the 160 acres should be fully transformed into 15 multi-use fields primarily used for soccer and one stadium field. Francisco Kjolseth | The Salt Lake Tribune Construction is moving along on the new Salt Lake City soccer complex along the Jordan River in North Salt Lake where the underlying infrastructure has been laid. By August of 2015 the 160 acres should be fully transformed into 15 multi-use fields primarily used for soccer and one stadium field. Francisco Kjolseth | The Salt Lake Tribune Construction is moving along on the new Salt Lake City soccer complex along the Jordan River in North Salt Lake where the underlying infrastructure has been laid. By August of 2015 the 160 acres should be fully transformed into 15 multi-use fields primarily used for soccer and one stadium field. Francisco Kjolseth | The Salt Lake Tribune Construction is moving along on the new Salt Lake City soccer complex along the Jordan River in North Salt Lake where the underlying infrastructure has been laid. By August of 2015 the 160 acres should be fully transformed into 15 multi-use fields primarily used for soccer and one stadium field. 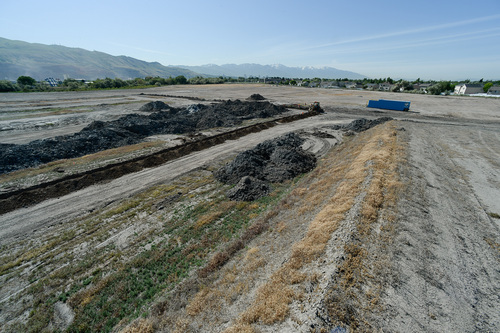 Francisco Kjolseth | The Salt Lake Tribune Construction is moving along on the new Salt Lake City soccer complex along the Jordan River in North Salt Lake where the underlying infrastructure has been laid. By August of 2015 the 160 acres should be fully transformed into 15 multi-use fields primarily used for soccer and one stadium field. Francisco Kjolseth | The Salt Lake Tribune Rick Graham, public works director for Salt Lake City talks about the construction that is moving along on the new Salt Lake City soccer complex alongside the Jordan River in North Salt Lake where the underlying infrastructure has been laid. By August of 2015 the 160 acres should be fully transformed into 15 multi-use fields primarily used for soccer and one stadium field. Francisco Kjolseth | The Salt Lake Tribune Construction is moving along on the new Salt Lake City soccer complex along the Jordan River in North Salt Lake where the underlying infrastructure has been laid. By August of 2015 the 160 acres should be fully transformed into 15 multi-use fields primarily used for soccer and one stadium field. 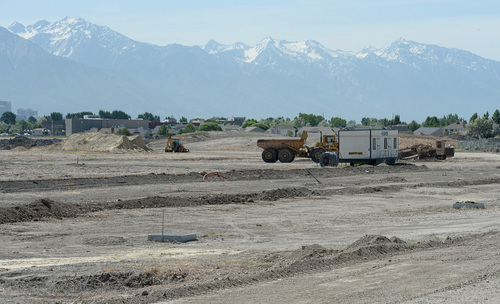 Francisco Kjolseth | The Salt Lake Tribune Construction is moving along on the new Salt Lake City soccer complex along the Jordan River in North Salt Lake where the underlying infrastructure has been laid. By August of 2015 the 160 acres should be fully transformed into 15 multi-use fields primarily used for soccer and one stadium field. 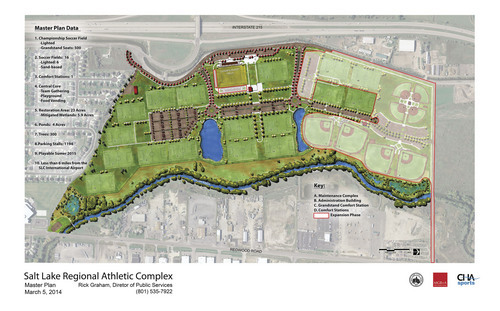 | Courtesy image Site plan for the new Salt Lake Athletic Complex. When Salt Lake City residents voted in favor of a $15.3 million bond to build a soccer complex in 2003, the Utah Youth Soccer Association had 35,000 members. Sports such as lacrosse and rugby that use similar fields were in their infancy in Utah. Now, with 53,000 kids playing in the UYSA alone, plus adult and high school soccer leagues and growing interest in lacrosse, every school field and city park open space that can be used for these sports is utilized, sometimes seven days a week. Parents often have to drive miles to find a piece of open grass where their kids can learn to play soccer. The logjam is about to ease up. 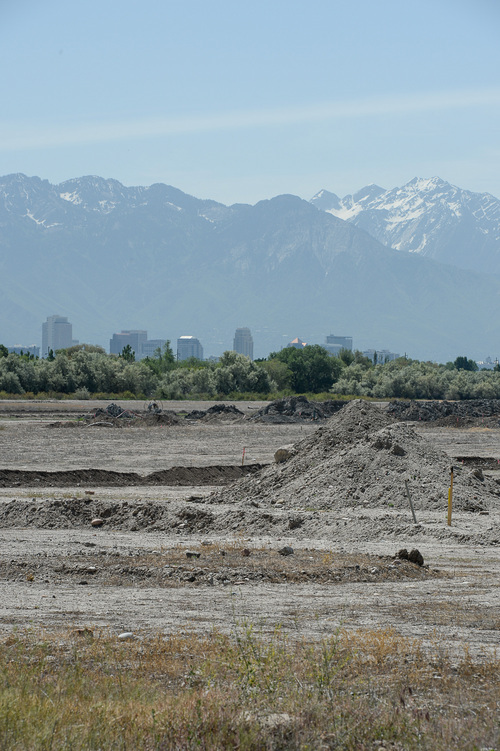 After more than a decade of delay, progress is being made on Salt Lake City&apos;s $22.8 million soccer complex between Interstate 215 and the Jordan River at 1900 W. 2200 North. Most of the electrical, water and drainage infrastructure is in place. Crews will begin to lay sod on the 16 fields in late August and the first events are scheduled in August 2015. The facility&apos;s first phase will include a stadium with 500 permanent seats and the capability to expand to 7,500 for a major event. The complex also will include six lighted fields; two rest-rooms; lighted parking areas; vending and concession area; a maintenance facility and a trailhead. Future development could include more soccer fields and some baseball diamonds if and when money becomes available. "There is demand for this," said Rick Graham, Public Services Department director for Salt Lake City. "With all of these active and popular community things, the city feels it has an obligation as best it can to meet those needs." Why will it have taken 12 years from the time voters passed the bond to the opening of a complex that was originally expected to include 25 soccer fields and eight baseball diamonds? Part of the problem is that few pieces of open space remain in Salt Lake City. The 160-acre tract  about the size of an average 18-hole golf course  that was selected was on wetlands adjacent to the Jordan River. After the city obtained the proper permits from the Army Corps of Engineers to mitigate for wetlands loss, environmental groups sued both the city and the federal agency. 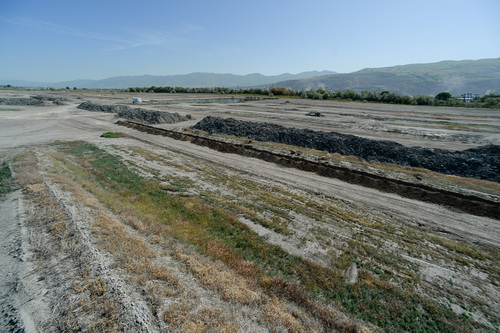 Construction began in 2010 but was stopped in 2011 when the Jordan River Restoration Network filed suit in 3rd District Court. This action sought to overturn the city council&apos;s August 2010 rezone of the area. The city eventually prevailed in court and now big earth movers are clearing and leveling the area. The complex includes a three-acre wetland site and 23 acres of riparian protection along the Jordan River. The city received $7.5 million from the Real Salt Lake soccer team as part of a deal to build Rio Tinto Stadium. "This is an enormously and necessary thing, giving kids a chance to play," RSL general manager Garth Lagerway said, noting that more kids playing soccer translates into more kids becoming soccer fans. He said the team has begun to establish a youth soccer footprint in the valley, recruiting players as young as 12 into a new, Salt Lake City-based location for its academy program, which is based in Arizona. However, Real Salt Lake apparently has no special field privileges at the new soccer facility. "There is no guarantee that they have for any uses or any space here," Graham said. "They have been an excellent partner." RSL&apos;s $7.5 million matching donation was a condition for issuing the bonds. 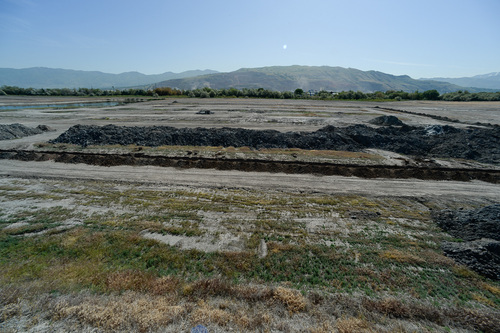 At last fall&apos;s groundbreaking, RSL owner Dell Loy Hansen called the construction of the fields historic for Salt Lake and the region. "Today, we are standing on a true field of dreams where 50,000 youth will play soccer on 16 fields," he said. "It&apos;s been a rocky road to get here, but. ... we reaffirm that [$7.5 million] commitment." Andrew Hiatt, UYSA CEO, said the facility will be the only one of its kind in the state. "It is as professional as you can get," he said, adding his organization is already talking about holding national and regional championships at the site. Graham said 10 percent of field time will be dedicated to tournaments. Parents should not be surprised if fees their children pay to participate increase slightly. Graham said this will be a pay-for-play facility that will charge leagues more than they currently play at Sunnyside or Fairmont parks. While the facility primarily will be used by Salt Lake City residents, it will host local leagues surrounding the city. 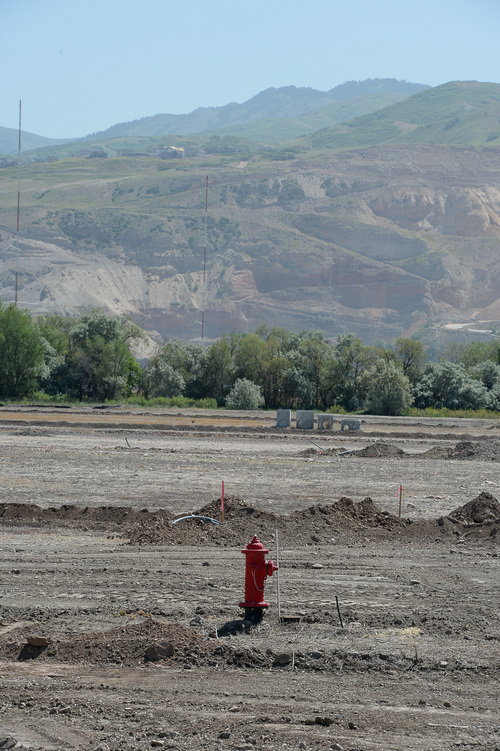 The public works director said the fact that the complex is near the Davis County line might mean future expansion might be funded by that entity or cities such as North Salt Lake or Bountiful, which also struggle to find fields to fill the demand. Salt Lake City originally thought all or at least the stadium field would use artificial turf. But that became cost prohibitive, at least up front. 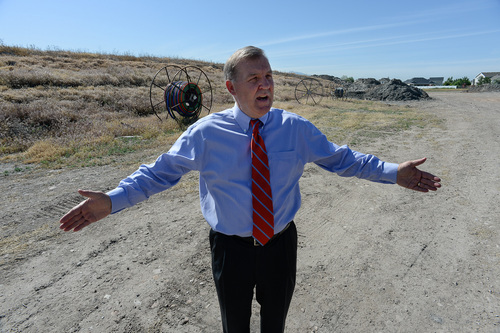 Graham also said a well was dug and a pond built in hopes of using secondary water to irrigate the fields, but neither worked out so treated culinary water will be used. Because the complex is about the size of a golf course, it will be managed in a similar manner by onsite crews. "It is cost-effective," said Graham. "The economy of scale is much greater when you can do it all on one site and not have it broken up where you move crews in and out and have extra equipment to share. This is going to be very much self-sustaining." Though located on the northern fringe of Salt Lake City, the complex has good access from nearby Interstate 15. Graham said its close proximity to the airport and the downtown hotel and restaurant facilities will help increase its economic impact, especially when it hosts regional and national tournaments. For now, the complex is a work in progress. But in little more than a year, it will be a major hub for Utah soccer.